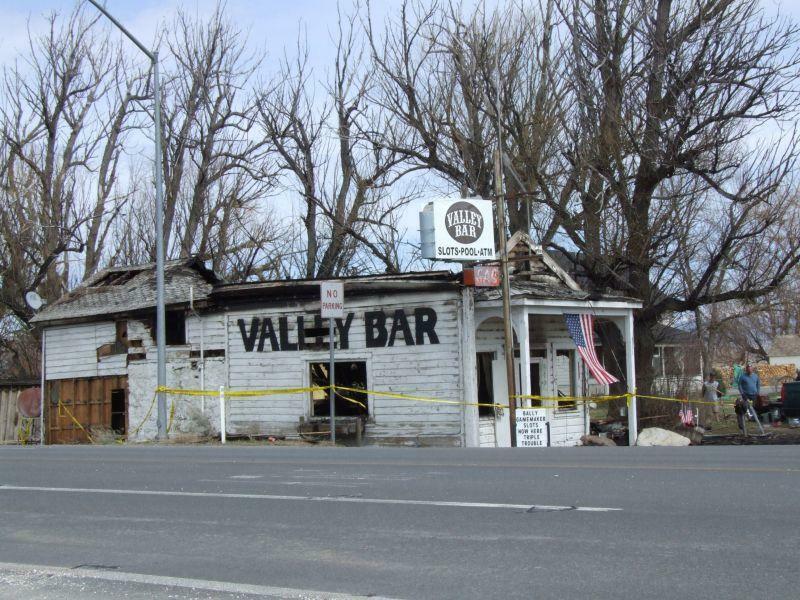 The old Valley Bar, on Hwy 88 in the Carson Valley, has burned down. According to the article, a fire started about 5am yesterday morning, and by the time firefighters arrived it was too late to save it. The roof collapsed soon after they got there, and although some of the walls are still standing, the building is pretty much a complete loss. The owners, who bought the place less than a year ago, are unsure yet if they’re going to rebuild. 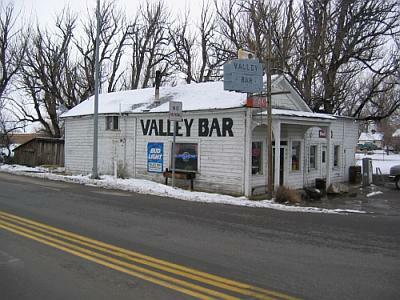 The Valley Bar, at the corner of Hwy 88 and Centerville Road, was one of the last remnants of the town of Centerville, a little oasis of trees in the middle of the valley. Once an independent town along the road to California, Centerville declined when the advent of cars and paved roads made it only a ten-minute drive in to Gardnerville. All that’s left now are about a dozen houses, a few leaning barns and, until yesterday, the Valley Bar. It sounds like there has always been a bar at that particular corner, and the current building was brought down from Virginia City in the 1930s. The bar was a familiar landmark along Hwy 88. It looked pretty rundown from the outside, with peeling paint and rusting equipment laying around, and at times the dozen or so motorcycles parked out front would be enough to keep a square like me away. But you could say that all that was part of its charm, and it was supposedly one of the friendliest places in the valley. Of all the times I drove by it, it was never empty. Even in a heavy snowstorm there would be one car that had plowed through the drifts, or a set of footprints leading up to the front door. Now that it’s gone it’s a big loss to the character of the valley, and even if they rebuild it it won’t be the same place. I’m going to try to get down there myself to take some pictures of the aftermath. But if we have any Carson Valley readers with a camera, scoot down there and upload a few shots to the site! I’m always looking for contributions from others, and you’ll be doing your part as citizen journalists.